This machine works exactly as advertised. Pros: They claim that you can sand painted surfaces without clogging up the paper. It’s true. My third picture is a stir stick that I use to stir my poly. There are at least a dozen coats on it. There was even a large drip. The stick took 3 passes with 100 grit paper. The paper showed no evidence of gumming up or even use. I have sanded several panels 12” wide with dust collection attached and there was no visible dust in the air and again the paper showed no signs of wear, so it will be inexpensive to use. 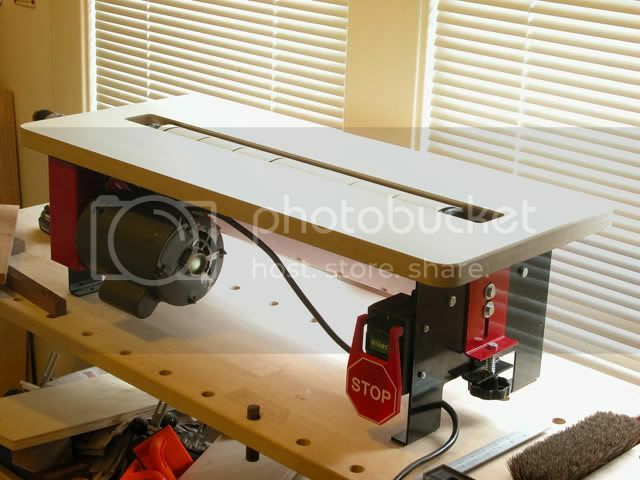 I bought the finished sander (Flat Master) because I was going to have to buy all the materials to build one. When I figured the costs it was about the same for the finished unit. If you have the materials on hand build your own the end results will be the same. They say you can use 1/4 HP motor, I’m on the look out for a 1/2 HP. My 1/4 is very easy to stall. The effective width only is about 16” because you have to be carefull not the catch the trailing end of the paper that is coming towards you. (Believe me I have done it.) They claim you can sand one half then the other with no grooves. I haven’t tried it. The top of the unit they sent me had a groove routed on the bottom for belt clearance. It was on the wrong side to the motor mount and not even close to where the belt is. My impressions: I had intended to store this unit on a shelf and pull it out when I needed to flatten a panel or door. I am now going to build a small bench on wheels because this thing is going to get more use than I thought. I used some low tack masking tape around the trailing edge as a reminder to stay away and also once you catch it the end will not hold on the velcro drum. The Flat Master comes with 100 and 180 grit and I would normally never sand without going through the other grits and won’t once I order them. But it did an impressive job just the same. They claim you can thickness sand with fences and feather boards. Someday I’ll have to try it. Once I find a 1/2 HP motor. Overall I’m very pleased with the way it works. I only gave it 3 stars mostly because of the errors in the top. Hey Jesse….Is that the one I see at the wood shows? I think the guys that make it are in Lowbanks… Not too far from us? Looks good… And I’ll have a look. Think I might half a 1/2 hp motor around. toyguy – if it is the same one that I am thinking of that you’ve seen at The Woodworking Shows, that’d likely be the SandFlee® (http://rjrstudios.com/). They’ve got a pretty neat little tool, methinks. The one he’s reviewing above is very similar in application, but they offer a “build it yourself” kit for a bit less (http://www.stockroomsupply.com/) I’d been intrigued by the stockroom supply version, thinking I could just build one for my Shopsmith. Recently, however, Sand Flee® has introduced a version for the Shopsmith. -Now, I know that this is kind of hi-jacking the thread (a little) – but if you want to see a video showing the purpose and use of a drum sander like this is, see http://shopsmithacademy.com/SS_Archives/SS106/SS106_Sand_Flee.htm. They are different and have a different purpose than, say, a Jet 16-32 open sander. Actually, yes Toyguy it is the one from our area wood shows. They are in Lowbanks but do not sell from their location, I asked, mail order only. Yes the kit is a bit cheaper if you have the materials on hand. If you have to buy them, then it is actually at bit more expensive, going by prices in our area. MrWoody – I’m so glad you posted here about the FlatMaster. I saw this for the first time last year at the WW show (here in northern California). I must have spent an hour off and on, standing at their booth watching, jaw dropped at the ease of use and “dustless” finish. I finally decided to drop the cash for the 24” model. Like you I realized that after materials, time spent and the likelihood of slight build errors, the prefabricated model was right for me. About 4 weeks after I ordered it at the show, it arrived. I had already purchased a motor and switch so i got right to assembling the unit. I don’t have a lot of experience with machine setup, so what appeared to be a simple motor install, belt adjustment and wiring exercise took me quite a while. I finally got everything together but really struggled with belt tensioning. The link belt is pretty straightforward and after a few knuckle busters I got it on the machined motor wheel and the drum wheel. I spent a couple of hours tightening bolts, testing, readjusting the drum height, tightening, re-testing…... I finally got tired and frustrated and vowed to get it right another day. It’s been sitting under my workbench since, just collecting dust (not of its own making). So, thanks for inadvertently motivating me. I just pulled it out, dusted it off and will give the setup another go. Fritz, set up is critical but is very easy. Lay a straight edge across the opening with 180 grit paper on the drum. There should be a gap just small enough to slide a piece of paper between your straight edge and the drum. Then after you have the paint off, change back to the 180 grit and finish the board. I still plan on ordering the in between grits, but you will be surprised. I have thought about buying this also. i saw it at the WW show and it kind of had that too good to be true thing going on so I figured that I would wait to hear other opinions. I liked the concept of this sander and bought the pre-assembled, steel model with a 30” drum. It arrived quickly and assembled easily. I used a 3/4 HP motor and it had plenty of power once the drum was adjusted to the proper height. Hand feeding is easy on the slick, wide table and ti removes material smoothly. After a few days of use, I called their service department about vibration and they had me check the roller for off-axis deflection. It was about .035” and their spec is for <.010” so they sent me a new roller without question or any charge. I installed it and it ran true but after several days of use it too began to vibrate. This does not seem to affect the sanding job but is hard on the sandpaper as the high side actually makes contact with the wood and wears more quickly. I think the 80” drum may be streetching the capacity of the material to resist sanding loads. I’ll let it sit for awhile (no projects at the moment) and see if the ‘set’ goes away. Other than that it is a fine unit. I didn’t have a dust collector port so used it ‘as-is’ and was amazed at how little dust it throws into the shop. That is the beauty of having the abrasive drum BELOW the workpiece. Leroque: Check to see if the belt is hitting the underside of the table. I had to cut a groove so that the belt ran clear. Absolutely no problems since. Thanks for the heads-up on the belt. Mine had a groove in the underside of the table and belt contact was not a problem. The only ‘unexpected’ event was that the undersides of the two fences were also contacted by the abrasive and it took a few minutes for enough paint and metal in thise small areas to be abraided away and then there was no further contact. I’m not sure what cuased the two rollers to deflect as I was careful to follow directions when setting the gap between the abrasive and the surface of the table. In fact, the initial setting of the roller was too low and I had to nudge the roller up on each end till it made contact with the workpiece. My guess is that 30” may be too long a span for the materials used in the construction of the roller and I am thinking about seeing what it would cost to have a hollow aluminum or steel replacement built to order. I imagine this would cost a bundle unless I could find a standard 30” roller from a supplier and adapt it to this unit. The only problem (inaddition to the vibration) is that the abrasive wears out more quickly on the high side of the deflection. I’ll post any further developments when and if they occur.